We simply cannot let February, which is Food Month here at Global Voices Online, pass without sharing with you ten delicious dishes from Sub-Saharan Africa. Make sure to add them to your recipe collections! Kamba (Prawns/shrimp) is loved in the coastal region [East Africa]. Shrimps taste better if cooked for just a few minutes on high heat. In the past I preferred fried shrimp only, but shrimp cooked with coconut milk is something that I would advise everyone to try. Believe me; you may never want fried shrimp ever again if you try this recipe. This recipe is exotic. 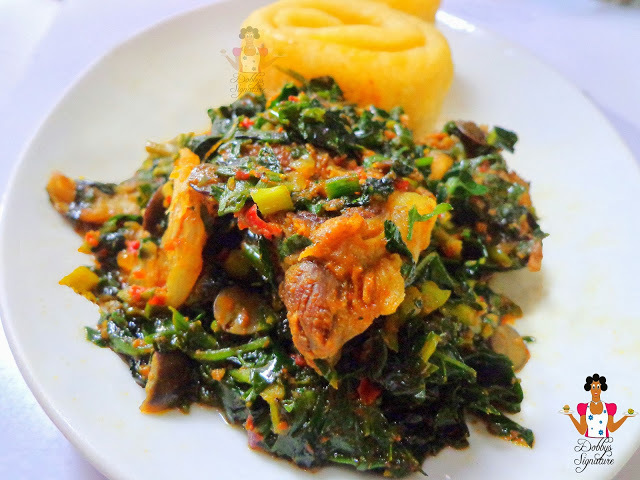 Efo Riro is a Nigerian vegetable soup. Photo used with permission from Dobby Signature. Efo riro” is a Yoruba word which simply means “Vegetable soup” and it’s enjoyed by many. This is because it’s really versatile and could be eaten with meals such as Rice, Yam and any type of Swallow. When I got to the market to buy the ingredients for cooking this meal, I actually got so confused when it came to choosing which Leaf to use for the soup. Senegalese national dish Ceebu jenn. Photo released in the public domain by Wikipedia user KVDP. There are about as many variations for spelling ceebu jenn (thieboudienne, thiep bu dinenne, ceebujenn…) as there are to making it. This rice (ceeb) and fish (jenn) recipe is the national dish of Senegal and can also be made with beef (ceebu yapp). If the dish looks familiar, it’s because it’s a descendent of paella. Matapa is a typical Mozambican dish prepared with young cassava leaves piled with garlic and flour extracted from the tubers, cooked with crab or shrimp. Many Matapa dishes add cashew nuts and can be eaten with bread, rice or alone. Are you ready to eat Matapa? Photo by Brandi Phiri. Used with permission. 8. 6 small-to-medium tomatoes (or about half a large 28 oz can of tomatoes; I imagine this might also be a small can, but I never have them in the house): enough to get 1 1/2- 2 cups when blended. Read the full cooking instructions from Betumi here. Begin by combining the flour, baking powder and yeast in a large bowl. Add enough water to make a batter the consistency of thin pancake batter. Cover the bowl and set it aside. Full cooking instructions are here. 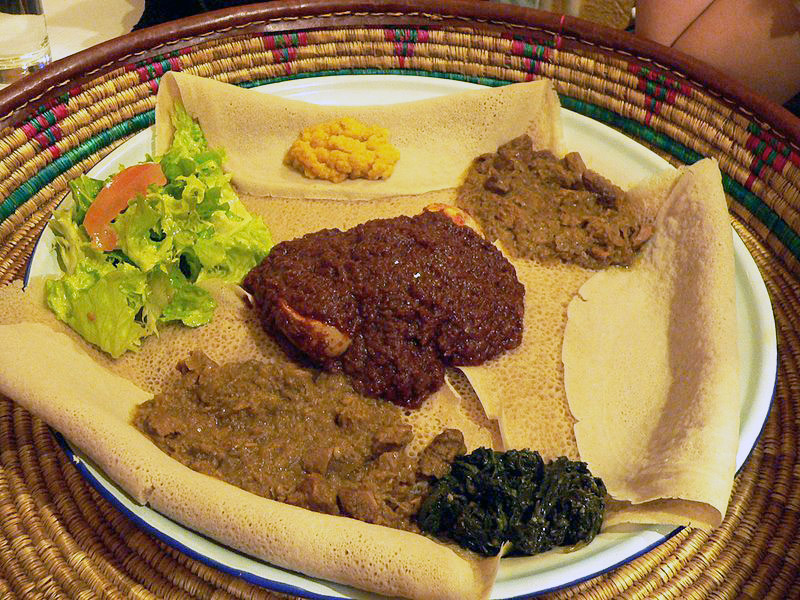 Ethiopian/Eritrean injera (flat bread), which can be eaten with dishes such as Doro wet. Photo released under Creative Commons (CC BY-SA 2.0 FR) by Wikipedia user Rama. 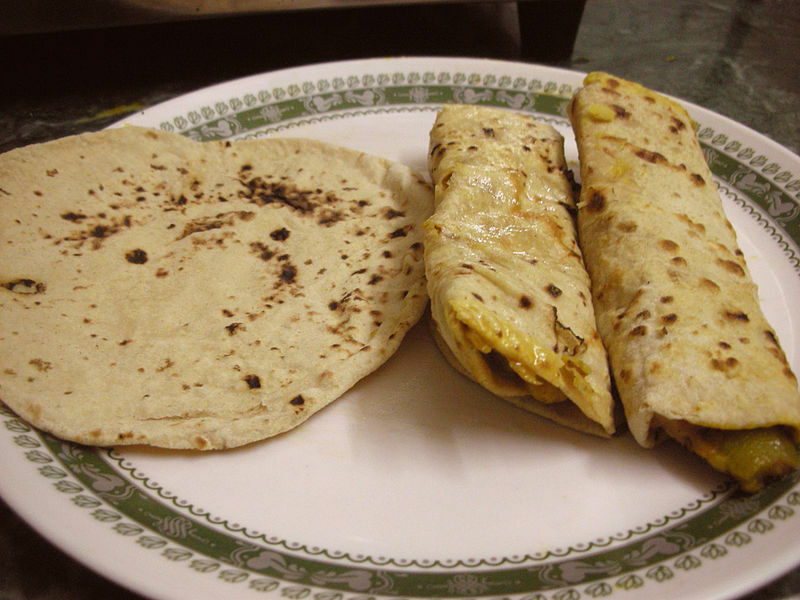 Chapati and chapati roll. Photo released under Creative Commons (CC BY-SA 2.0) by Flickr user Kalyan. Learn chapati cooking instructions here. 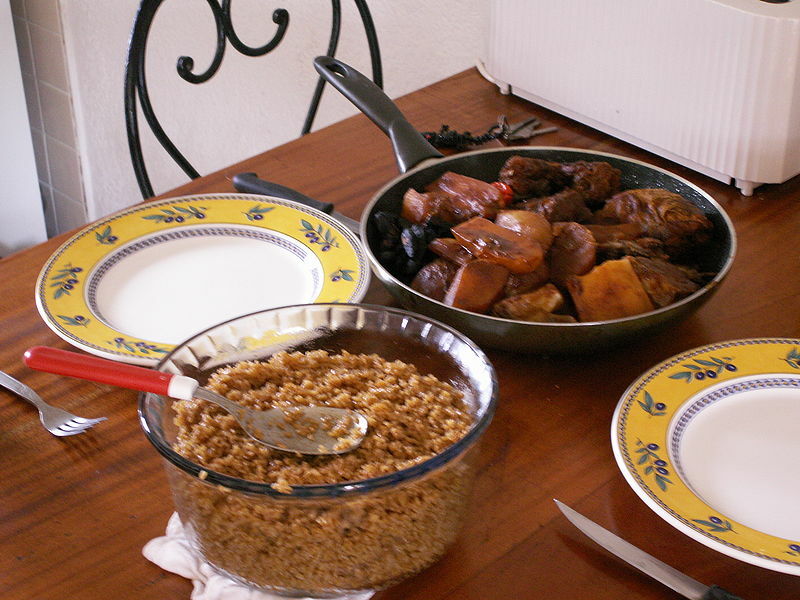 At the top of my favorite Cameroonian food is Ndole, which is always present at parties ,and when cooked properly flies off the table. It is an absolutely irresistible combination of peanuts, bitter leaves (substitute spinach), meat (stock fish, shrimp,) crayfish (dried shrimps) and oil. If I could eat this every day I would, It is rich, high in calories and loved by many. It tastes like a stew spinach dip with all the spices and meat. Follow Immaculate's instructions here to make your own Ndole. 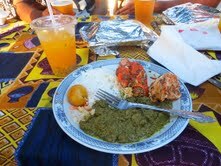 Sub-Saharan Africa has many more yummy dishes to offer the world than those listed above. Make sure that you explore the blogs linked in this post for more! Survival International s’est procuré un rapport détaillant le projet de réinstallation forcée des Bushmen à l’ouest du Botswana par les autorités locales, en dépit d’une récente décision de la Haute Cour interdisant leur expulsion forcée et l’assurance du gouvernement central qu’aucune expulsion n’aurait lieu. En juin dernier, les Bushmen de la communauté de Ranyane ont contesté avec succès devant la Haute Cour les tentatives du gouvernement de les expulser de leurs terres. Mais ce nouveau rapport — intitulé ‘Ranyane relocalisation phase II’ — expose le projet du Conseil du district de Ghanzi de relocaliser les Bushmen de Ranyane le 12 août 2013, pour un coût de près de 900 000 dollars et d’expulser ‘ceux qui résistent à la relocalisation’. Malgré la décision du tribunal, le Conseil a prévu d’affamer les Bushmen pour les faire partir de leurs terres en suspendant la fourniture de services tels que la distribution de rations alimentaires et de pensions ; en supprimant les services de santé ; en coupant leur approvisionnement en eau et en détruisant les installations sanitaires et les postes de santé. An annual competition has been launched for the public to vote for the seven best natural wonders of Africa, with the voting currently underway. The competition is organized by global grassroots endeavor Seven Natural Wonders and at this point includes 12 sites from across the African continent. Discover the shortlist and other suggested contenders which didn't make the cut this year. The Okavango Delta is the world's largest inland delta, created from the rains that fill the Okavango River. The Namibian government has plans to build a hydropower station which would regulate the Okavango's flow, but environmentalists fear that this project could destroy most of the fauna and flora in the Delta. 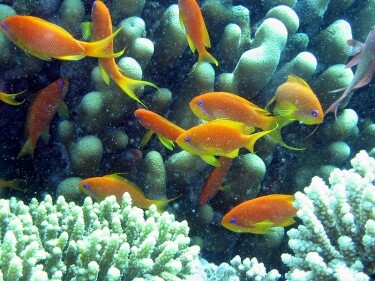 The Red Sea is a seawater inlet of the Indian Ocean, lying between Africa and Asia. Its Reef stretches over 1,240 miles along the coast of Egypt, Sudan, and Eritrea and contains more than 1,100 species of fish. Anthia goldfish in the Red Sea from Wikimedia commons. Image in the public domain. 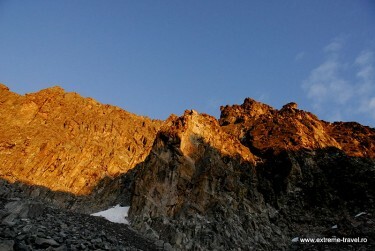 Mount Kenya is the highest mountain in Kenya and the second highest in Africa, after Kilimanjaro. It was covered by an ice cap for thousands of years. The Mount Kenya ecosystem provides water directly for over two million people. The park receives over 16,000 visitors per year. 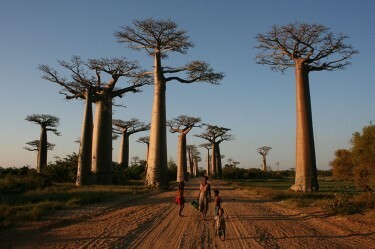 Local people on the Avenue of the Baobabs, Morondava, Madagascar. Image on Wikimedia commons, in public domain. The Avenue of the Baobabs is located between Morondava and Belon'i Tsiribihina in the Menabe region in western Madagascar. Baobab trees, up to 800 years old, stand about 30 meters in height and this particular species is endemic to Madagascar. The site was present in the news recently because it was victim of a wild fire that burnt down newly planted trees around the giant trees. Tsingy de Bemaraha Strict Nature Reserve in Madagascar. Image on Wikipedia (CC-license-BY-3.0). 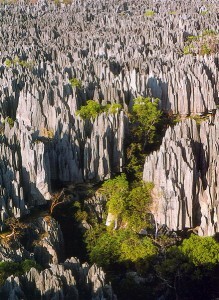 Tsingy de Bemaraha is a nature reserve located near the western coast of Madagascar in the Melaky Region. This National Park is a UNESCO World Heritage Site, and the main attraction is the stone forest that is composed of limestone needles originating from erosion patterns from groundwater and winds. Zuma Rock near Abuja by Jeff Attaway on FlickR license (CC-BY-2.0). 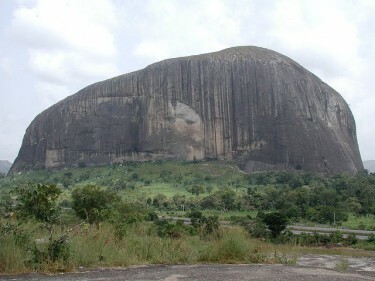 Zuma Rock is a 725 meter high monolith found in Nigeria on the road out of Abuja. Its nickname ‘Gateway to Abuja' is derived from this road. Eruption at the Peak, April 2007 on FlickR by zatiqs (CC license-BY-NC-SA). Le Piton de la Fournaise (The Peak of Furnace) is a shield volcano on the eastern side of Réunion island in the Indian Ocean. 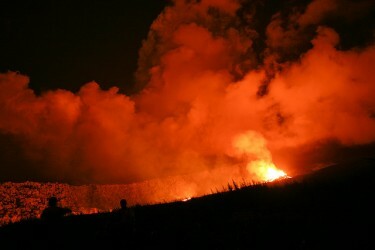 It is one of the most active volcanoes in the world. Aldabra Island, Seychelles on FlickR by Johny Shaw (CC-BY-2.0). 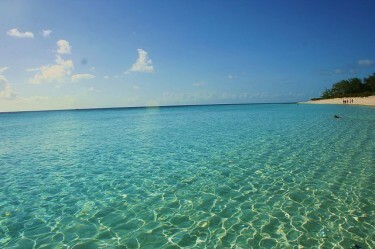 Aldabra is the world's second largest coral atoll and forms part of the Seychelles. Aldabra is almost entirely free of human interference and is home to the world's largest population of giant tortoises. Kibo on Mt Kilimanjaro by Chris 73 (CC-NC-BY). Kilimanjaro is the highest mountain in Africa and the highest freestanding mountain in the world at 5,895 meters. The current shrinking and thinning of Kilimanjaro's ice field is similar to other glacier retreat in mid-to-low latitudes across the globe. 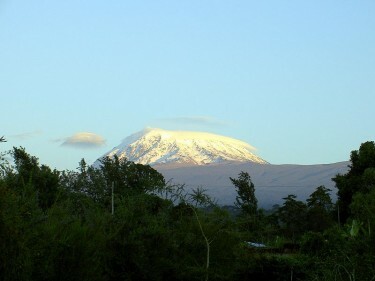 At the current rate, Kilimanjaro is expected to become ice-free some time between 2022 and 2033. 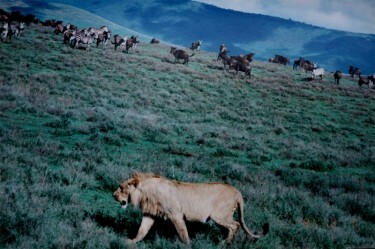 A young male lion at the hunt in Ngorongoro Crater by Brocken Inaglory on Wikimedia (CC-BY-3.0). The Ngorongoro Crater is a large, unbroken, unflooded volcanic caldera located in the west of Arusha in the Crater Highlands area of Tanzania. The crater plays host to almost every individual species of wildlife in East Africa, with an estimated 25,000 animals within the crater. Wildebeest crossing the river by Stefan Swanepoel in Wikipedia (CC-BY-3.0). 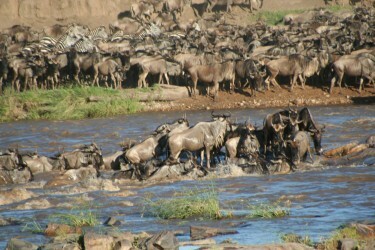 The Serengeti migration is the longest and largest overland migration in the world. Each year, the great wildebeest migration begins in the Ngorongoro area of the southern Serengeti of Tanzania in January to March, when the calving season begins; some 750,000 zebra precede the migration of 1.2 million wildebeest. 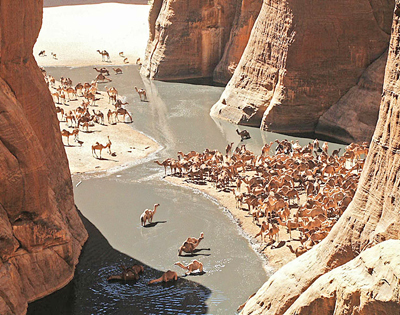 Camels in Guelta d'Archei, Ennedi, north-east Chad. Image on Wikipedia (CC-BY-2.0). The Sahara Desert is the largest hot desert in the world. The desert encompasses, at least in part, the countries of Algeria, Chad, Egypt, Libya, Mali, Mauritania, Morocco, Niger, Western Sahara, Sudan, and Tunisia. The southern border of the Sahara is marked by a band of semi-arid savanna called the Sahel. A number of natural wonders were omitted from the shortlist, so a few bloggers have added their own suggestions via their blogs. A slight controversy was the fact that a few countries were featured several times while others were not mentioned at all, despite having worthy candidates. The Victoria Falls at the border of Zambia and Zimbabwe is already selected as one of the seven natural wonders of the world. 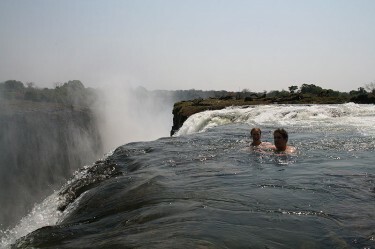 Swimming at the edge of Victoria Falls in a naturally formed safe pool, accessed via Livingstone Island. Image on wikimedia commons, released into public domain by Ian Restall. The Blyde River Canyon is located in Mpumalanga and forms the northern part of the Drakensberg escarpment. It is 16 miles (26 kilometers) in length and is on average around 2,500 feet (762 meters) deep. The Canyon consists mostly of red sandstone. 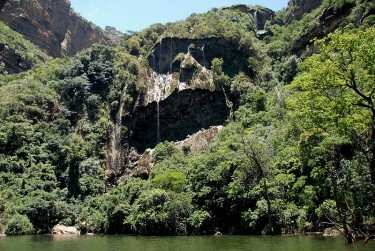 The Weeping Face of Nature located in Blyde River Canyon. Image by Ptosio on Wikipedia (CC-BY-3.0). Feel free to add any sites that you feel were omitted in the selection process in the comments section below. Kwami Ahiabenu, II, is a team leader of International Institute for ICT Journalism, the co-ordination organisation for African Elections Project (AEP). With over nine years of experience in management, marketing, new media, Information and Communication Technologies (ICTs) and development, Kwami was Executive Director of AITEC Ghana and a former board member of Ghana Information Network for Knowledge Sharing (GINKS). He served as a key committee member for the organization of World Summit on Information Society (WSIS) African Regional Meeting 2005. He has undertaken several training sessions on new media across Africa. He is a Steve Biko and Foster Davies Fellow. African Elections Project was established in 2008 with the vision of enhancing the ability of journalists, citizen journalists and the news media to provide more timely and relevant elections information and knowledge while undertaking monitoring of specific and important aspects of governance. AEP has covered elections in Ghana, Cote d‟Ivoire, Guinea, Mauritania, Malawi, Mozambique, Namibia, Botswana, Togo, Niger and Liberia. African Elections Project uses social media tools and ICT platforms such as blogs, interactive maps, Twitter, Flickr, YouTube and Facebook. L. Abena Annan (LA): What is your affiliation with the African Elections Project? Kwami Ahiabenu, II (KA): I am part of [the] founders, currently serving as a consultant to the project, providing management support and serving as the training director. LA: How long have you been involved with the project? KA: Since the birth of the project in year 2008. We started the project by launching the coverage of Ghana, Cote D’Ivoire and Guinea elections. Ghana elections did take place in 2008 but Cote D’Ivoire and Guinea took place in subsequent years. LA: How would you describe this project for the average person to understand? What do you intend to accomplish with it? LA: What countries have you worked in? Do you intend to go to other countries as your website states only 10? KA: We have worked in 11 countries to date, namely Botswana, Namibia, Ghana, Guinea, Cote d’Ivoire, Mauritania, Mozambique, Malawi, Togo, Liberia and Niger working across English, French and Portuguese speaking countries. We currently cover each election happening on the continent on our homepage with Ghana elections 2012 being the current country we are covering. In addition to elections coverage, we have done some work in post-elections focusing on transparency and accountability issues and currently in partnership with Africatti we are monitoring health and education issues in two districts of Ghana under “Enabling Governance and Economic Transparency in Ghana using new media Project,” with plans to roll out to other African countries in the near future. LA: How can people effectively use your website or information provided on it? KA: Our audiences come to our website because of the high quality content which we generate and they consider it useful for themselves, so we can only improve our services by ensuring we constantly provide timely and relevant content to our audience base. LA: Do you believe new technologies have improved democracy in Africa? Why? KA: Democracy is a long journey, in this direction new technologies are assuming important roles in ensuring our people benefit from the fruits of democracy. That said, the journey is a long one; though we are recording some improvements we still have a long way to go to ensure that Africa as a whole nurtures its democracy. LA: How empowering would you say technology has become to citizens of Africa? KA: Technology can only play a role when the fundamentals are in place. If there is no true freedom of speech or free press, technology role becomes limited, though one may argue that technology can contribute to empowerment but it is important to stress the fact that technology plays a facilitating role and it works best when empowering environments are in place and protected to ensure technology’s role strive. LA: What do you think the effect of technology on democracy will be 10 years from now? KA: Technology roles cannot be discussed in isolation. Rapid growth of the tenets of democracy on the continent is a sure guarantee that technology impact on democracy is going to grow and become very important each passing day. LA: What are your biggest challenges as an organization? KA: We like to deploy cutting edge technologies in our coverage, but the high cost of ICT tools coupled by expensive bandwidth are always a challenge. Also user content generation is picking albeit slowly and our work will be made more interesting if the grandmother in the village can also contribute to our project. LA: Any successes so far? KA: The project has contributed significantly to building the capacity of journalists and citizen journalists in covering elections using new technologies, more importantly providing them with skills set they need to cover elections impartially thereby contributing to better elections which is a cornerstone of any democracy. One key achievement worthy of mention is the successful pilot of Ghana Post elections Project (”Because Accountability Counts”), where we contribute to the promotion of the culture of political accountability by providing a mechanism for citizens to match campaign promises and manifesto versus action and inaction of the ruling government. The project incorporates citizen journalism mostly driven by mobile phones and has so far covered elections in 11 African countries namely Botswana, Cote d'lvoire, Ghana, Niger, Togo, Guinea, Malawi, Mauritania, Mozambique, Liberia and Namibia. This is one of key result area. The project has also contributed local content from an African prospective for the global market, thus, presenting the African story using African voices. We have also contributed to the body of knowledge in African elections and democracy through our country specific countries and recently we contributed “A JOURNEY THROUGH 10 COUNTRIES - Online election coverage in Africa” article in the Journal of Journalism Practice. At its innovation fair, “Moving beyond Conflict”, Cape Town, South Africa 2010, the World Bank ranked African Elections Projects as innovative in the area of improving governance and accountability through communication technologies. Thumbnail image: An elderly lady being escorted by his son to vote. Photo courtesy of @liberiaelection. Beyond their ethnic, political and regional divides, people unite together around their national football team. We saw the First Lady of Gabon dancing like an excited schoolgirl every time one of the eleven players of the ‘Azingo Nationale' scored a goal and became “the Panthers” for their country. The people of Equatorial Guinea were ecstatic with the qualification of their national team, languishing in the midst of one of the most ferocious dictatorships. According to Human Rights Watch, journalists who have visited the country to report on the human rights situation have been detained, interrogated, censored and deported. In the fervour surrounding the 2012 African Cup of Nations, there are two key points that attract attention. The first is the absence of some of the higher achieving teams in African football. Imagine a Euro competition without Germany, Spain, Holland and England. Impossible you say, even though Ukraine or Poland would not have to participate in the qualifying rounds as host nations. And yet, this is what happened in Gabon and Equatorial Guinea. Indeed, for the first time in ages we will not see Egypt, Cameroon, Algeria, Nigeria or even South Africa in this championship. How did this happen? …If these teams do not qualify then there will be others to replace them. It's a breath of fresh air seeing teams like Botswana, Niger and Equatorial Guinea making their debuts in the Cup of Nations. After the cancellations of the matches against China, Gabon, Salvador and Mexico, Cameroon has again cancelled a friendly match at the last minute for the fifth time since the start of the season. 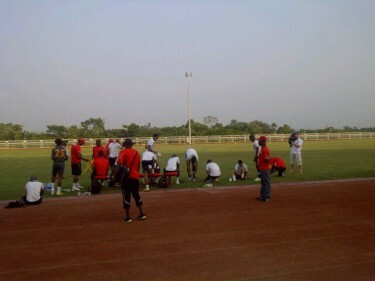 The players went on strike, once again, in protest against the federation over their bonuses for the match. Due to the absence of attendance bonuses, the players have decided not to travel to Algiers and to not play any part in the match against Algeria scheduled for the 15 November. The President of the highest court in Moroccan football announced that a deal has been made with the Atlas Lions in that they accept that they will not receive any form of attendance bonus if they fail to reach the quarter finals of the 2012 African Cup of Nations. The 23 players in the side receive 5 million CFA francs (10,000 USD) in attendance bonuses. This amount will be paid if the team is eliminated in the first round. In the quarterfinals, the bonus of each player will rise to 8 million, rising further to 10 million in the semifinals and then to 20 million in the final (40,000 USD). The coach, Zahoui François will also enjoy his share of the pie, receiving double the bonuses of his players. Earlier this week the Malian football team received their bonuses for qualifying for the 2012 African Cup of Nations. Two hundred million CFA francs (40,000 USD) were given in cash to the players and coaching staff before the national team left Lomé (Togo) for the final stage in their preparations for the competition. Teodorin Obiang, the Minister for Agriculture presented a cheque for 500 million CFA francs (760,000 euros) to Francisco Pascual Eyegue Obama Asué, the Minister for Sport, in the absence of the national team in Mbini (mainland Mali). He added a cheque for 20 million CFA francs (30,400 euros), 10 million that had been promised for each goal scored ; the team only won the match 1-0 but he explained that the goal disallowed by the referee deserved to be credited with a bonus. This blog points out that the actions of Teodorin, tipped to succeed his father as president, are under scrutiny by the Americans. The generosity of petrodollars being used for the bonuses for the Equatorial Guinea football team makes the Republic of Guinea look like a poor relation. In Conakry, the first problem was in trying to find the money to pay for the bonuses. As reported by lejourguinee.com, the country set up a National Committee for Support, led by General Mathurin Bangoura, Minister for Housing and Urban Development with the aim of raising funds for the bonuses. Notably, the first contributions came from the Indian community settled in the country. There are some concerns surrounding the bonuses given to the Senegalese side. On Wednesday the Sports Ministry gave the squad bonuses amounting to 140, 650,000 francs in full for their qualification for the 2012 African Cup of Nations. Unlike Senegal, who failed to win their opening match in the 2012 Africa Cup of Nations, Ghana, another competition favourite, managed to win their opener, beating Botswana, who were participating in this tournament for the first time. This, the first match in Group D, took place on Tuesday 24 January in the Stade de Franceville, Gabon. Botswana fought bravely during their first ever appearance in the Africa Cup of Nations. A video summary of the Ghana-Botswana match is available here [fr], courtesy of Direct 8 Sport. @Fasokan: Loud noise and applause from Macina following Mali's goal. @Fasokan: Fans from Macina are hoping for a second goal from Mali. On Wednesday 25, the first match on Day 2 of Group A, Zambia versus Libya, resulted in the first nil-nil draw of the competition. Torrential rain caused kick-off to be delayed by an hour and a quarter with the match finally starting at 6.15pm, after some doubt as to whether it would go ahead. @founseni_soro: Senegal - a great footballing nation, but great disappointment in the 2012 Cup of Nations. Ivory Coast and Burkina Faso met at Malabo later that day for the second match in Day 2 of Group B. The Elephants of Ivory Coast beat the Stallions 2-0, qualifying for the quarter finals while Burkina Faso were eliminated. Day 2 of Group C on the Friday saw Gabon beat Morocco 3-2 and Tunisia beat Nigeria 2-1, securing quarter final places for the Panthers of Gabon and the Eagles of Carthage. The 2012 Africa Cup of Nations can be followed on the BBC website and on Twitter using the hashtags #CAN2012 and #AFCON2012. Africa: 2012 Cup of Nations Kicks Off! The Africa Cup of Nations began in Bata, Equatorial Guinea this Saturday January 21, 2012, kicking off three weeks of fierce competition. The Cup of Nations, the most important international football competition in Africa, is taking place in Gabon and Equatorial Guinea between January 21 and 12 February. Here is a round up of the first three days of the tournament. Libya took on Equatorial Guinea in the curtain raiser on 21 January, and it was co-hosts Equatorial Guinea, making their tournament debut, who took a surprise 1-0 win. With just six minutes remaining, Balboa, the Equatorial Guinea number 11 finally opened the scoring after a one-on-one with the Libyan goalkeeper. The score stayed 1-0 until the final whistle, to the delight of the Equatorial Guinea fans who had packed the stadium. The Senegalese fluffed their entry to the competition with a 2-1 defeat inflicted by Zambia on the same day. Senegal fans took to the web to place the blame on coach of the national team. le souci avec un entraîneur local c'est que même s'il se rend compte que le capitaine par exemple Niang n'est pas au niveau il aura la crainte la peur ou la pudeur de le faire sortir au détriment de la victoire bien sur!! The problem with having a local coach is that even if he realises that the captain, let's say Niang, is not good enough he'll either be afraid or too modest to take him off, to the detriment of getting the win of course! Tout le monde savait avant même le début de la CAN que les zambiens sont très vifs et utiliseraient cette vivacité pour gérer les sénégalais beaucoup plus costauds. Alors lui l’entraîneur et son staff devraient trouver un bon système pour les contenir avant de les attaquer.Donc je trouve kil n'a pas fais son boulot qui était de voir les choses venir et de jouer avec des joueurs rapides mais surtout de ne pas trop bourrer cette attaque ou personne ne se retrouve . Everyone knew, even before the Cup of Nations began, that the Zambians are very energetic and would use that energy to combat the much bigger and stronger Sengalese. So the coach and his staff should find a system to contain thembefore going on the attack. He hasn't done his job which is to anticipate and play fast players but above all not to throw men forward who then can't find each other. The second matchday saw the entry of one of the competition favourites: the ‘Elephants' of Côte d'Ivoire. A magnificent strike by Didier Drogba in the 39th minute secured the victory for Côte d'Ivoire over Sudan. 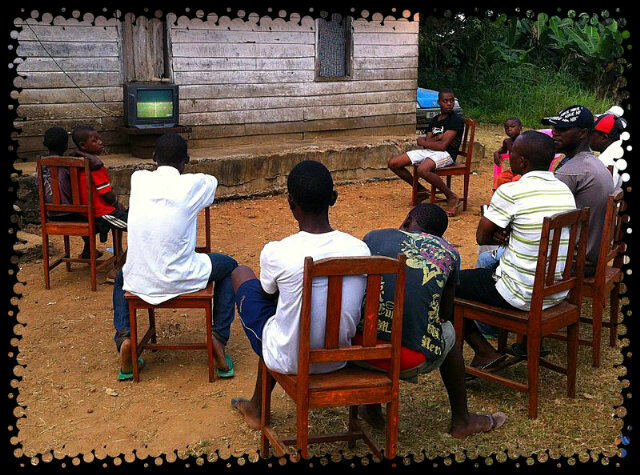 The win for the Elephants wasn't enough for every Ivorian fan on the net however. Many felt that they could have done better. la conservation d'un unique but nous a donné des sueurs froides. keeping hold of a one goal lead brought us out in a cold sweat. Angola also played their first game and overpowered Burkina Faso with a 2-1 victory. Gabon, the second co-host team of the 2012 Cup of Nations showed their strength with a 2-0 win over Niger, the opening Group C match of the tournament played in a fantastic atmosphere in the Stade de l'Amitié in Libreville. que dire?!! !merci aux gars, il fallait ça pour la beauté du spetacle et naturelement monter a tt nos adversaires que nous sommes la! !bien en place et on a pas peur!! !vive la can, et vive encore plus nos pantheres;que Dieu benisse le gabon!!!!!! what can I say?!! !thanks to the lads, we needed that for the beauty of the contest and naturally to show all our opponents that we're here! !right on the spot and with no fear! !long live the cup of nations, and may our panthers live even longer;God bless Gabon!!!!!! The 2012 Cup of Nations can be followed on TV5 Monde, Canal+ Afrique and on Twitter and Google+ via the hashtags #CAN2012 (in French) et #ACN2012 (in English). Two similar topics, published just months apart. But they come with a big difference. The first article was published in an Open Access Journal, free and available to anyone willing to click on it and read it. The second article hails from a scientific journal published by a large conglomerate. Unless you have institutional access, which costs hundreds of dollars, you most likely must pay the publisher $31 (€22) to read the piece. The internet opened up new methods to disseminate information and, for users, to access it. It also reduced distribution costs. But if research about diseases like Malaria continues to remain behind pay walls, Open Access proponents ask, what good is it? All over Africa, financial models from the world of print keep scientists, students and policy makers separated from new ideas and research. Currently, Sub-Saharan Africa remains the least developed region of the world in the area of research. This is partly attributed to inability of research centres in developing countries to pay for the high cost of online journal access as well as subscriptions to print versions. Open access offers many opportunities for scientists in the developing world – not only improved access to international scientific literature, but also the opportunity to develop (or re-develop) their own national and regional journals. Such journals have a pivotal role to play in creating the environment and infrastructure needed for research to flourish. Information professionals, scholars and publishers around the world are currently celebrating the fifth annual Open Access Week. Events across Africa are taking place to help solidify those gains across the continent. UBRISA, the University of Botswana Research, Innovation and Scholarship Archive, allowing faculty and students from the institution to place their research in a central repository where it can be stored and accessed. Ethiopia is home to three repositories: The Economic Commission of Africa, the International Livestock Research Institute and Addis Ababa University Library Dspace. KNUSTSpace, the institutional repository for the Kwame Nkrumah University of Science and Technology in Kumasi. From a European-based repository, a list of South African Open Access projects. In this video by Leslie Chan, Dr. Paul Nampala, Science Editor of African Crop Science Journal (ACSJ), argues that greater open access will actually increase journal readership, even if it does decrease the overall number of paid subscriptions. Charles J. Greenberg, a Medical Librarian at Yale University in the United States, blogs at OpenBioMed.Info. He recently interviewed Raoul Kamadjeu, a physician and co-founder of the Pan African Medical Journal. Greenberg: You are a founding editor of the Pan African Medical Journal (PAMJ). To promote the online publication of original studies from the African medical and public health communities, PAMJ will not charge article-processing fee for any accepted article submitted from African researchers or institutions or from any researcher and institution around the world. How can you afford to support this generous business model? Kamadjeu: Yes, we do not currently charge authors fees. Our 2011 author’s survey (http://www.panafrican-med-journal.com/pamjnews/NewsArticle.php?NewsId=news4dffa0d8f2713) showed this as one of the main reasons why authors submit to us. We are able to afford this business model because we currently benefit from the generous support of the African Field Epidemiology Network (AFENET) with which we have a memorandum of understanding; but we are not naïve, reaching financial independence is key if we want to sustain our current growth and remain a journal of continental scope. Your question brings the wider issue of the financial viability of African journals? They rely heavily on support from donors, some journals charge authors fees; it will be interesting to know how these models work for them. We are looking into traditional and innovative ideas to reach financial sustainability; article processing fees is part of the plan in the medium term; however, establishing a reputable journal remains our main priority; this will help ensure financial sustainability. I just want to add that support to African journals is important if we want to ensure that some level of medical publishing survives on the continent, particularly nowadays, with the explosion of medical journal franchises. 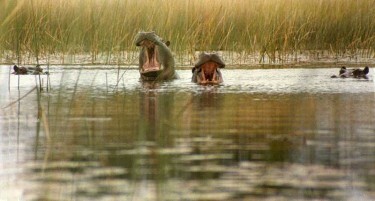 Botswana: Photo: So Where Do You Want to Stay? In May, the second India and Africa Summit was held at the African Union headquarters in Addis Ababa, Ethiopia. This Summit should lead to the adoption of two documents: the Declaration of Addis Ababa and the Cooperation Plan between India and Africa (which can be found on the official website of the African Union [all links in French unless otherwise indicated]. Indian Prime Minister, Manmohan Singh. Image by Agência Brasil, Creative Commons (2.5 Brazil). Acts speaking louder than words, and in line with this new partnership, an Institute of information technology will be built in Ghana, another Institute for educational planning in Burundi, an Institute of foreign trade in Uganda and a diamond institute in Botswana. One of the most important investor is the Indian telecom giant Bharti Airtel, which has disbursed $ 10 billion to access the mobile telephony industry in 15 African countries. Indian car maker Tata trades in 11 countries on the continent and has the monopoly of public transportation in Uganda and in the district of Thiès, in Senegal. 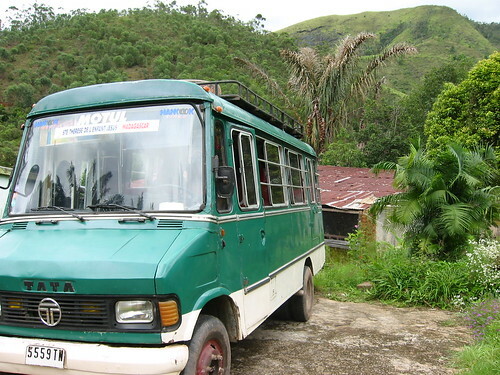 A Tata minvan in Africa. Image by Robin Elaine on Flickr (CC BY 2.0). The way Delhi manages trade and cooperation with Africa differs from the Chinese way, with a swoop on mainly private local companies, but bought with subsidies from the Indian state, via a merger and acquisition strategy, whereas China favors direct trade with governments. But India also has this feature: that it tries to develop approaches inclusive of the regional economic institutions such as ECOWAS and SADC. […] the issue is, for many, the prospect of the continent building different relationships from those marking its exploitation for centuries, under the north-south axis. With this new partnership, African leaders should learn a lesson and break away from the corrupt ways that have plagued the continent. The culture of human rights must come first, if we want to make the most of the dividends, which will put an end to wars, and the internal power struggles which have prevented Africa from making a good start. On the Radio France International website, an article on the Addis Abeba Summit has also generated comments from readers. They are much more vocal in rejecting “L'indépendance sous haute surveillance” (Independence under strict surveillance, lyrics from a song by African singer Alpha Blondy), which is to say, the post-colonial cooperation model imposed by France. […] I don't see (President of Ivory Coast) Ouattara grant juicy markets to Indians or Chineses and deprive France of them any time soon. Unless he does not wish to stay long in power. The Indian cooperation approach with Africa est more altruit that the one privileged by France under Mr. Sarkozy. From now on, Africans must turn their back to countries which impose governance at gun point. These forms of cooperation, where Africa's natural resources are coveted by many (Europe and the BRIC countries) cannot be a sustainable solution for the development of this continent. Cooperation must be built around a long term vision that will allow African to sell some day Tata cars to India, China or France (ok, I'm caricature there). This involves training young people, democracy, and long term ambitious economic policies the outstretched hand (begging) of this continent. The “Kër Gi” band from Bargny [should] perform a concert called “Guur Nduuy” which means “léboue tradition”. The “Guur Nduuy” show trace some aspects of the rich immaterial heritage of the léboue community.